* SANTA PHONE CALL – TELEPHONE RESERVATION PAGE! This is Santa’s very popular LIVE Santa Phone Call service since 2004. Make your children’s holiday even more spectacular with a Santa Phone Call to your home, or office from the north-pole. ALL your children will receive a LIVE one-on-one portion of the talk with Santa by telephone. Listen to Santa Phone Call Samples at Right! Reserve your Santa Phone Call DATE and call TIME from those still available. Then fill out the small form at the bottom with your personal details. You are then redirected to Santa’s Questionnaire to supply details about your children. 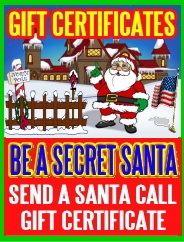 Ready to Reserve a Live Santa Phone Call by Telephone? Use the form below and select your reservation date and time now, then follow the steps above to make payment of $59.95 and complete Santa’s Questionnaire. NOTE: CALL TIMES ARE ALL EASTERN TIME! PLEASE DO NOT RESERVE A TIME IF YOU ARE NOT READY TO PURCHASE NOW. RESERVATIONS MUST INCLUDE A PAYMENT AND QUESTIONNAIRE AFTER BOOKING. UNLIGHTED AND RED DATES ARE FULLY BOOKED! Are You a Parent with a Question? Call 1-970-223-3659.